Budget Muffler Brake & Automotive is a full-service auto repair shop that has been offering San Diego County expert auto repair services at some of the lowest prices since 1941. We performed a wheel alignment in San Diego, CA at our auto repair shop. This Infinity was also given a complete suspension inspection. The owner of this Chevrolet Suburban needed an auto repair shop to perform a complete drop on his car. Our San Diego, CA auto shop tucked the rims and tires just how he wanted. This is our computerized alignment rack and machine. Our San Diego, CA auto repair shop is equipped to perform any needed repair work with our state-of-the-art tools and equipment. Budget Muffler Brake & Automotive performed a complete aftermarket suspension and installed a flowmaster exhaust system for this Ford Bronco 2 in San Diego, CA. We replaced a full exhaust system on a Cadillac CTS. Our auto repair shop offers San Diego, CA expert exhaust system installation, repair, and replacement with superior service. We put on a set of 22’’ tires and performed a wheel alignment for this 2011 Chevrolet Camaro SS in San Diego, CA. This Ford E350 from San Diego, CA needed a new cooling system and some routine maintenance. This Cadillac CTS needed an air bag system that would allow the car to be lowered all the way to the ground, but also raised to stock height for driving. Our San Diego, CA auto repair shop is fully equipped to accommodate low riders as well as high performance sports cars. Our highly trained team performed an exhaust system repair for this Ferrari. Our San Diego, CA auto repair shop not only offers exhaust system repair, installation, and replacement services for vehicles of all makes and models, but also excels at specialty vehicles. We lowered this Chevy S10 and performed a complete drop on air bags in San Diego, CA. 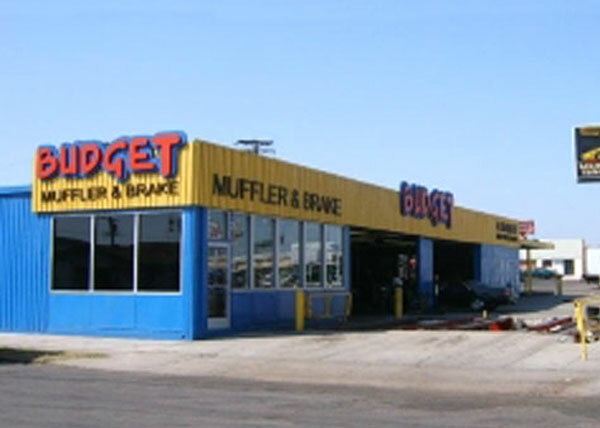 Budget Muffler Brake & Automotive is a family-owned and -operated, full service auto repair shop in San Diego, CA. Our highly trained team and ASE-certified lead technicians use only the latest diagnostic technology. Here is one of Budget Muffler Brake and Automotive’s technicians working on a new double X pipe for a 2015 Mustang GT at our auto repair shop in San Diego, CA. We installed a completely new exhaust system and new cold air intake for a client from San Diego, CA who wanted the best performance he could get out of his new car. Budget Muffler & Automotive installed this Magna performance exhaust system at our auto repair shop in San Diego, CA. This client from San Diego, CA needed new rims and tires for their Infiniti G35. We installed some customer supplied aftermarket performance parts in this Cadillac. Clients are welcome to bring their own parts to our auto repair shop in San Diego, CA for expert installation. We installed a new exhaust system for this 1941 Chevrolet Truck in San Diego, CA. At Budget Muffler Brake & Automotive, we serve all makes and models from classic cars to luxury vehicles. We completed a wiring harness replacement at our San Diego auto repair shop for a client whose 07 Chevrolet Silverado's wiring harness caught fire due to a short. The owner of this BMW 3 series needed an exhaust system replacement. Our San Diego auto repair shop removed the original engine and installed a new V8 engine. Budget Muffler Brake & Automotive installed this customer supplied exhaust system for a client from San Diego, CA. We completed an axle back exhaust system installation at our San Diego auto repair shop for this Ford Mustang. Our San Diego auto repair shop is located in City Heights right on the corner of 47th and El Cajon Blvd and next to Dominos Pizza. Budget Muffler Brake & Automotive installed a 3’’ exhaust system on a brand new 2015 Toyota Tacoma Prerunner at our auto repair shop in San Diego, CA. This Cadillac needed a performance exhaust system installation. At Budget Muffler Brake & Automotive, we’re able to complete most of our exhaust services within a day. We installed special burnt exhaust tips for a client from San Diego, CA. This client from San Diego, CA needed to install a complete dual performance exhaust system in their 60s Ford Mustang. A large selection of tips displayed on a wall at our auto repair shop in San Diego, CA. Come visit Budget Muffler Brake & Automotive today. Budget Muffler Brake & Automotive installed some suspension parts on this Nissan Titan truck at our auto repair shop in San Diego, CA. The truck has a massive lift, just shy of a monster truck. This new exhaust system was installed at our San Diego auto repair shop. Our highly trained team made sure everything fit perfectly. A new performance exhaust system was installed in a 2007 Cadillac CTS at our San Diego auto repair shop. A normal busy day at Budget Muffler Brake & Automotive at our location in San Diego, CA. As you can see, we serve all makes and models. Budget Muffler Brake & Automotive also serves motorcycles at our San Diego, CA auto repair shop. This customer wanted to install new piping onto his Harley motorcycle. Once we finish installing the exhaust, saddlebags and special tips will be added. We completed this new performance exhaust system installation at our San Diego, CA auto repair shop. Budget Muffler Brake & Automotive carries leading brands such as MagnaFlow, Flowmaster, Flowsound, Eliminator, Corsica, and Street Flo. Different kinds of aftermarket catalytic converters, all CARB (California Air Resources Board) legal. We outfitted this 2017 Honda Civic with custom black chrome dual exhaust tips at our auto repair shop in San Diego, CA. Budget Muffler Brake & Automotive installed 4 wheel disc brakes for our San Diego client’s 1972 Chevy pickup. We’re the best automotive shop in San Diego for brake system upgrades and customizations. We installed a lowering kit and replaced the clutch on this 1972 Chevy pickup at our San Diego muffler shop. We are equipped to work on all makes and models of vehicles, from low riders to high performance sports cars. We installed these “through the fender exhaust tips” in San Diego at our auto repair shop. Budget Muffler Brake & Automotive has experience installing mufflers on nearly every type of car and truck, and can complete most exhaust services within a day. A customer from San Diego, CA came to our auto repair shop to have us install a dual MagnaFlow muffler exhaust system in their 1973 Porsche 914. This classic car had a 350 Chevy engine. Our highly-trained technicians installed a new muffler exhaust system at our auto shop in San Diego. Budget Muffler Brake is equipped to work on all types of cars, hot rods, lowered cars, and luxury vehicles. This MagnaFlow muffler exhaust system was installed at our San Diego auto shop. We carry leading brands like MagnaFlow because they offer everything from single-chamber racing mufflers to quiet-performance mufflers. This is a dual MagnaFlow muffler exhaust system installation was completed at San Diego muffler shop. We offer affordable prices on custom exhaust systems that are available in a wide range of design options. This customer header back performance exhaust system was installed by our highly trained team at our auto repair shop in San Diego, CA. During a routine maintenance inspection for a San Diego, CA customer’s vehicle, we found a broken ball joint. At Budget Muffler Brake & Automotive, we perform any needed repair with with state-of-the-art tools and equipment. The old engine of this 2007 Jeep Commander sucked a valve down the cylinder. Budget Muffler Brake & Automotive replaced the damaged engine with a completely rebuilt engine. Contact our auto repair shop in San Diego, CA for an engine rebuild today. Budget Muffler Brake & Automotive has one of the largest exhaust system inventories in all of San Diego, CA. We are also able to custom make pipes. Small sample of some performance mufflers. Budget Muffler Brake & Automotive built a new 3’’ exhaust system for a 2015 Mustang GT in San Diego, CA. The complete exhaust system included a double X pipe, one of the newest technologies available. We built a double X pipe for a San Diego, CA client’s 2015 Mustang GT. While the lowest price for a double X pipe can be as high as $499 online, Budget Muffler Brake and Automotive built this pipe for a fraction of that price. The owner of this 2015 Mustang GT needed an auto repair shop to build a double X pipe. We installed a completely new exhaust system, built the double X pipe, and added a new cold air intake at our location in San Diego, CA. This wall at our auto repair shop in San Diego, CA is displaying some of our performance mufflers. Our technicians installed this dual exhaust system at our San Diego auto repair shop. We provide expert exhaust system installation, repair, and replacement at highly competitive rates. Our highly trained technicians completed engine modifications in San Diego for this Chevy pickup. If your car’s check engine light is on, bring it in to Budget Muffler Brake & Automotive for free engine code reading and diagnostic. The Budget Muffler Brake & Automotive team provides expert car repair and maintenance for all makes and models at our San Diego auto shop. We enjoyed seeing the variety of cars featured at the 2018 Las Vegas SEMA Show. Staff from our San Diego car repair shop traveled to Las Vegas to learn about nearly 3,000 newly introduced automotive parts, tools, and components featured at the 2018 SEMA Show. The Budget Muffler Brake & Automotive staff traveled from our San Diego auto repair shop to Las Vegas, NV for the 2018 SEMA Show. The SEMA Show is the world’s premier automotive specialty products’ trade event. Our skilled team of ASE-certified technicians attended educational seminars, automotive product demonstrations, and special events at the 2018 SEMA Show. We are always looking for ways to improve our auto repair services for our San Diego clients. I am new to the area and Budget was mentioned to me as a great place to go. Mike has taken care of me a couple of times. A real nice professional guy who will go out of his way to make your experience as quick and easy as possible. A total professional operation worthy of your money . . .